Thanks in part to Chrysler’s “Imported From Detroit” ad campaign and a more upbeat narrative of the city’s prospects in the national media, hailing from Detroit is becoming a badge of honor. Reflecting that momentum are hundreds of Motor City expatriates who are taking hometown pride to the next level. Launched in November 2011 by 10 young professionals who were born and brought up in metro Detroit, BARD is now setting up infrastructure to host fundraising events for Detroit-based charities in cities across the country — all “to bring the Detroit community together in these cities,” says Vollman, a Cranbrook Schools graduate now living in New York. BARD’s own roots are in the city it supports. Vollman says she and a group of 20-somethings home for the holidays began throwing a small event at The Townsend Hotel in Birmingham the day after Thanksgiving. The annual Gobble Wobble fundraiser supported different Detroit charities each year. 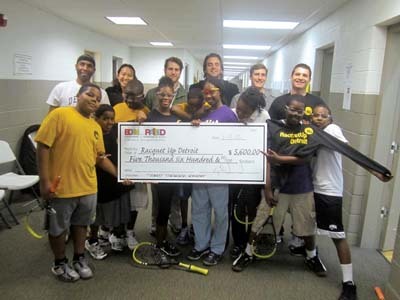 What started as a small way for visiting expatriates to get together and do good for their community snowballed, earning $25,000 last year, partially supporting Racquet Up Detroit. A second out-of-state event, Motown Throwdown, was held in Chicago last month, and the organization has heard from expats in Boston, Los Angeles, and Washington, D.C., expressing interest in hosting similar functions in the future. An event in Detroit is being planned for this summer.